I am thankful for Canada, a country where a three-month election is viewed as interminably long. I am thankful for Canada, a place where coffee drinking is seen as an inalienable right and decaf is deemed sacrilegious. I am thankful for Canada, a land of great natural beauty: vast forests, majestic mountains, thousands of lakes and rivers, and millions of Canadian women. I am thankful for Canada, where a moose may just be seen running down your suburban street (Hey, it happened in my suburb! It was on CBC and everything!). I am thankful for Canada, a peaceful and harmonious land where people beat the crap out of each other on ice… while wearing sharp skates… and carrying big sticks. I am thankful for Canada, where a young child can grow up to be Tragically Hip. I am thankful for Canada, a land flowing with milk, honey and thousands of micro breweries. I am thankful for Canada, the country that gave us the canoe and poutine and sometimes canoes full of poutine. 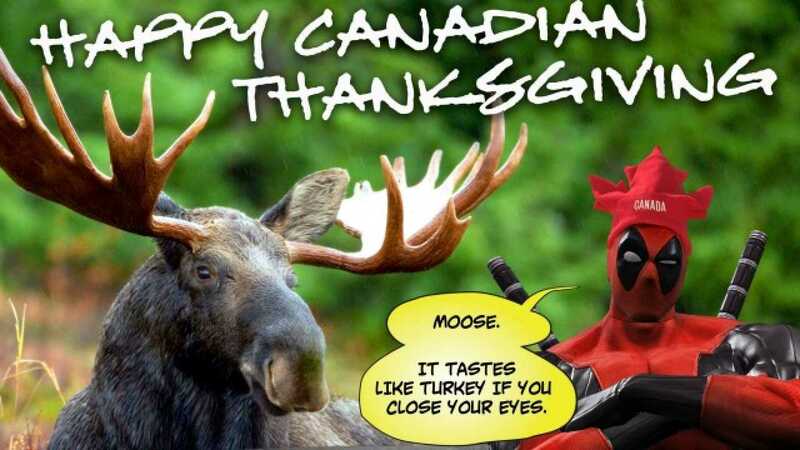 I am thankful for Canada, home of famous fictional characters like Wolverine, Deadpool and Pamela Anderson. I am thankful for Canada, home of famous historical figures like Billy Bishop, Pierre Trudeau and Pamela Anderson. I am thankful for Canada, where young men named Justin can grow up to be Prime Minister or dreamy pop star. Or possibly both. I am thankful for Canada, a country so polite it makes the Brady Bunch look like the Kardashians. I am thankful for Canada, the warmest place on earth that is famous for snow and ice. I am thankful for Canada, a country that gave me my wife, my favorite Canuck. I am thankful for Canada, my (adopted) home and native land!